If this does not sound like Greek to you then you probably find economics interesting, like I do and are considering a career in economics. Read on then! This statement, by the way, was made the RBI governor Mr. Raghuram Rajan who took over reigns this September. My first introduction to Economics was when I started watching the union Budget on television with my father. I did not understand the implications of it then but it became an annual affair. When I started grasping facts, I started reading the newspapers and later, television channels, to interpret what a certain announcement in the Budget meant and what the tax-payer had to shell out for that. Since I have such a profound interest in economics and considering the constantly deteriorating financial situation world over, I thought choosing a career related to the subject will help me earn immense job satisfaction, along with being paid for what I love doing and I will never be out of jobs because everyone will need advice on money matters! I tried to picture myself in each of the roles that an economics enthusiast can possibly explore. Advising those who run the nation! Wow! That seems quite a daunting task. And it is so indeed. Advising policy makers who design schemes that run into hundreds of crores of rupees, implementation of such schemes, making recommendations on the country’s economic policies are a few things that officers of the Indian Economic Service (IES) do as part of their daily work. To be an IES officer, I will have to be between 21 to 30 years of age and should hold a post-graduate degree in economics/applied economics/business economics/econometrics. With the requisite qualification, I will have to clear the UPSC examinations and interview rounds. Once that is done, I will be on my way to serve the nation. To be an effective officer, I will need to keep abreast of major economic trends not just in the country but elsewhere in the world and bring in policy measures/alter existing ones to suit our economy. Seems quite an interesting career option, especially if one considers all the privileges that go with being a civil servant! As a consultant/analyst at a research/rating firm, I will be able to study and analyse movements in stock markets, growth/decline trends in industries, interpret policies, rate world economies on the basis of their performance and be in a position to give sound advice to all ranging from small business houses to governments on how they can plan their next move. Similar to the IES, I will need at least a Masters in Economics for this. A career in this field will ensure exposure to a wide variety of literature on economics and latest economic trends, not to mention a good pay package. Well, not literally but figuratively of course. With a Masters degree in Economics or even Bachelors and some decent communication skills, I will be able to make a fine place for myself in the world of business journalism. Business journalism is an extremely lucrative career option and there is always a need for people with a good grounding in the basics. If I am ready for a great deal of pressure, odd/long working hours, stiff competition but also vast exposure, several learning opportunities and a rewarding career, then journalism is the way to go! Advising people on their money! 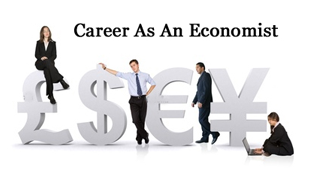 An economist (with at least a Masters degree in the subject) can find employment in the corporate sector at various levels. Several corporates employ economists to be able to seek advice on important mergers, acquisitions and/or even on changes in government policy and what it means for them. Similarly, companies providing financial services, brokerage firms and even banks employ economists for the same purpose. If working in the corporate sector is of interest, then I can surely make a very successful career as an economist in this sector. For all those future IES officials, economists, analysts and researchers to do their job well, they will need a teacher who has taught them well! So as an Economics professor, I will be able to indirectly strengthen economies. To be a professor I will need to have at least a Masters degree in Economics after which I will have to clear the NET examination. Why not?! If I dare to dream big and have some political acumen, I may even become the country’s finance minister some day and be in a position to create policies that are based on a nuanced understanding of economic conditions!